My first memories of having brownies dates back to my college days. There was (in fact its still there) a restaurant in Guwahati named JBz which served sizzling 'Brownie with vanilla ice cream and chocolate sauce'﻿. Oh Boy! Having that dessert all for myself was sheer indulgence! I used to savour each bite and even today when I think of it, it sets my mouth water!! But, in those times, I had never once thought of finding out how to make it, cooking was never my cup of tea! But neccesity is the mother of invention and now that I have developed a liking for baking, I keep trying new recipes. This recipes comes from Nita Mehta's book which I borrowed from my elder sister on my last India visit. I had made it once for our girl's get together. But, that time I had baked it in an about less than 7" square cake tin and it puffed up and was more like a cake. Never the less it was tasty. 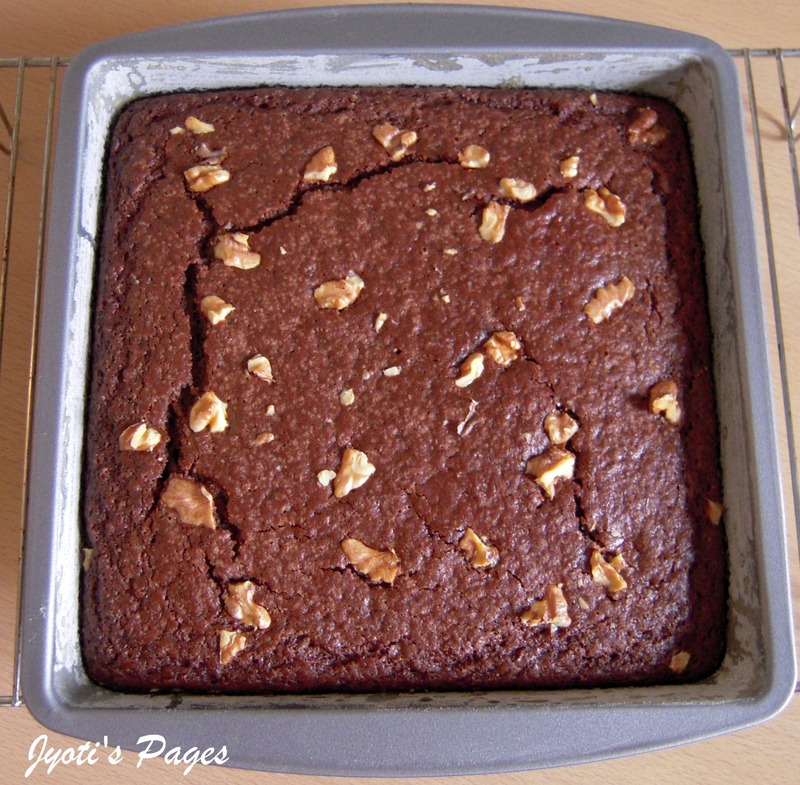 Last week, I was in a mood of baking and tried these brownie again. This time in a 9'' square cake tin and they came out well. 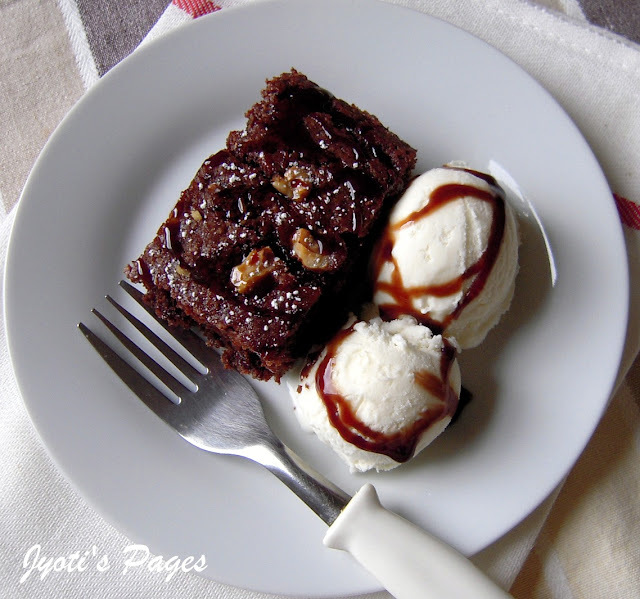 Moist and fudgy and it was great when combined with vanilla ice cream and chocolate sauce. 1¼ cups sugar. (Original recipe had 1½ cup+2tbsp). 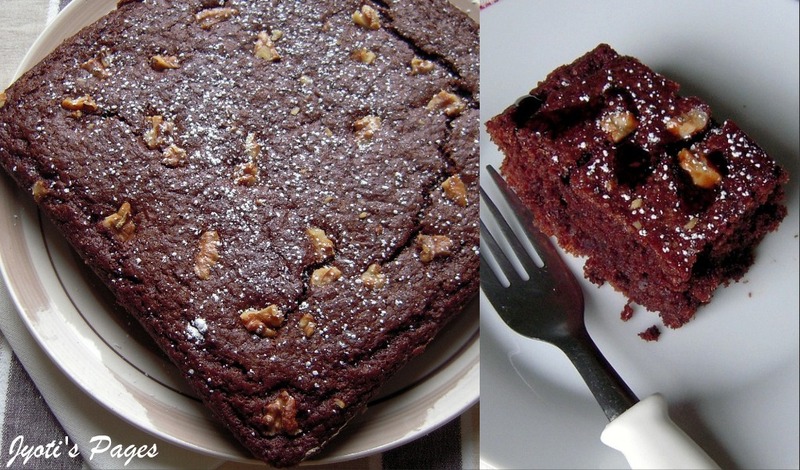 2 tbsp crushed walnuts and chocolate sauce for decoration. Grease the tin and dust it with flour. Preheat the oven at 160 C.
Boil milk and add vinegar. When the milk starts to curdle, keep it on fire for 30 seconds and take it off gas. Let it cool down completely. Sift all the dry ingredients and keep the mixture in a mixing bowl. To it add the paneer with whey and oil. Add essence and milk well with a wooden spoon till well combined. Pour the batter in the prepared tin and sprinkle walnuts over it. 6. Bake at 160 C for 40 minutes. When done remove from oven and let it cool completely. Remove the brownie from the tin. Sprinkle powdered sugar over it. Cut into peices. Warm it in microwave for 20 seconds and serve with ice cream, topped with chocolate sauce. 1. A few days back, I was seeing Barefoot Contessa. Ina Garten was baking a Brownie and shared a tip. She asked to give a nice tap to the cake tin on the rack after baking it for 30 mins. It helps in releasing any air that might be formed because of the leavener and makes the brownie more fudgy. I will try this technique next time, I bake a brownie. 2. I have tried this recipe with both 1 tbsp and 2 tbsp Vinegar. First time when I had baked it, I used 2 tbsp of vinegar. On adding 1 tbsp vinegar to boiled milk, it curdled instantly. But since the recipe called for another tbsp, I added it. Vinegar helps in leavening which makes it more cake like.So, next time I tried it with 1 tbsp only and got better results. I was more fudgy and moist. I will recommend using 1 tbsp vinegar only. 3. I reduced the sugar by 1/2 cup from what was given in the original recipe and it was perfect for me. Adjust sugar to your own liking and taste. Linking it to Champa's Bake Off , ToReview's Food Palette Series Brown and Divya's Brownie Event. I follow Nita's recipe myself..It comes out awesome ,except that I find it a little lacking in sweetness,so i add more sugar.. yummy looking pics!I am wary of adding vinegar to milk.. try to avoid it as much as possible. @ Bhargavi: I think we can add same amount of lemon juice instead.. It should work well..
@ Lindy: Thanks.. I loved taking those pics nd loved it more to finish off the plate..
From Ram : It looks really yummy. From Bhabhi : Jyoti didi aap se bahut kuch sikhna padega. @ Bhaiya& Bhabhi: Thanks for the lovely comment! Wow simply mouthwatering...gorgeous... and beautiful texture. yummy dish!!!!!!! !interesting blog.....im ur happy follower now!!!!!!!! Delicious I wil book Mark and try. Hi, first time here. 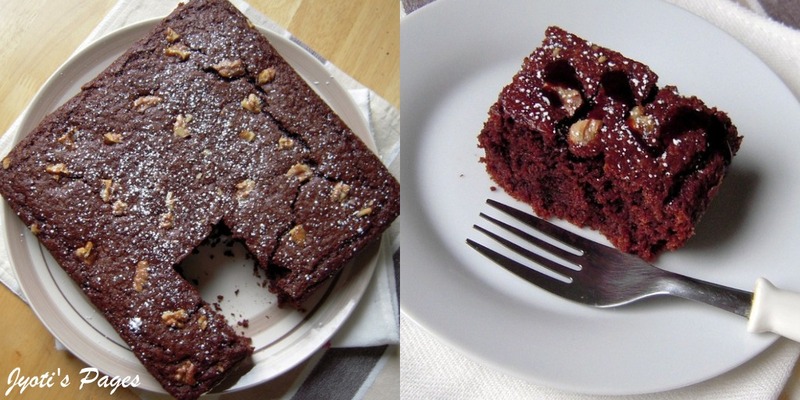 Nice blog you have & this brownie looks great, without eggs too!! Thanks for sharing. Hi Jyoti. so thankful to you for this vegan recipe as I am a vegetarian. I tried this recipe and it turned out to be so very tasty. I faced a little problem while taking the brownie out from the baking pan. I baked it at 160 degrees for 4 minutes but observed that its undone so baked for another 20 minutes and then another 10 minutes. The top was cooked nice and was soft too and the toothpick also came out clean. When the pan was completely cool I tried taking the brownie out from the pan but to my utter shock a large portion of he bottom kept sticking to the pan. Can you tell me where did I go wrong? Was it greasing of the pan or temperature settings ? I presumed the base required extra 5 - 10 minutes of baking. Please help so that I can give it another try. Thank you in advance.